What better way to teach kids about the political climate than socially conscious rhymes? Kaitlin McGaw (left) and Tommy Shepherd, Jr. (second from right) with their spouses and children. As of late October, as many as 245 children remain in federal detention, according to government data obtained by the American Civil Liberties Union (ACLU). The actions of the current administration and the stories that emerged from all of the family separation cases briefly dominated the news cycle — in recent weeks, this humanitarian crisis has been slowly fading in the news. For Bay Area-based band Alphabet Rockers, founder Kaitlin McGaw, music director Tommy Shepherd, Jr., and DJ Juan Amador (Wonway Posibul) use their platform to speak about social justice, race, class, and the complex topic of immigration. Last year, their album Rise Shine #Woke earned them a Grammy nomination for Best Children’s Album. What better way to teach kids how to understand and navigate the current political climate than through the power of socially conscious lyrics and catchy rhymes? They just released the video for “Walls,” written and performed by Amador, Shepherd Jr., McGaw, and Kat Evasco. In the video, we hear Evasco in the opening sequence: Yeah, I do identify as American, I’ve lived in this country since I was 5 years old, and there’s no amount of papers that can take that away from me. She's speaking to the place of Dreamers (Deferred Action for Childhood Arrivals) in this tumultuous political climate. “When taking the lead writing this song, I immediately thought about this topic of walls, and how kids don’t feel safe nowadays because of the things they see on TV, the taunting they receive in school,” Amador said. "That was important to me." 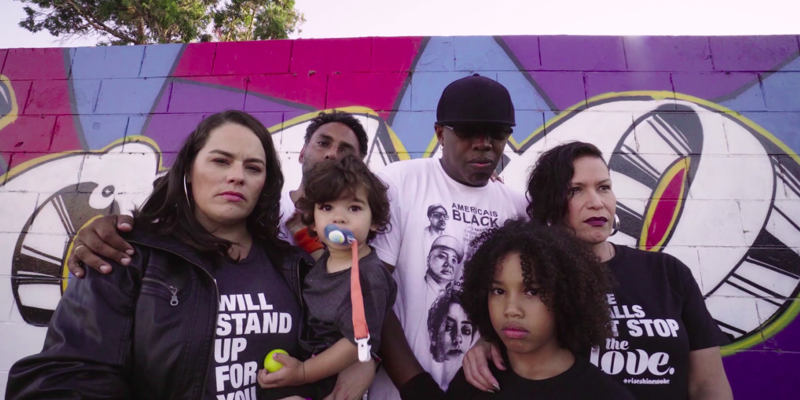 The video has lots of familiar faces, including actor Emilio Delgado, who for 44 years played the role of Luis on Sesame Street; Sophie Cruz, the young activist fighting for her parents' right to legalize their status; and DJ Agana, a local DJ and muralist. Also making cameos are poet Yosimar Reyes and UndocuQueer artist Julio Salgado. For Alphabet Rockers, it was essential to shoot this video and share it, given the constant anti-immigrant rhetoric by the current administration. “I remember performing at a school in Daly City before the album was even released, around the time when 45 was starting to threat DACA,” McGaw recalled. “For me, that day I was like, 'OK, this is about to go down. We are stepping up. '” Since they perform for and in front of kids, she said it's important to spread the message of “we are standing up for you, for your parents, for all of our families, for everyone." The urgency to put the video out increased as more stories involving family separation at the border continue to emerge. “The situation was escalating even further, and we were just like, 'This is why we are doing this,'” Amador said. The video is a heartfelt depiction of what makes this country great: a melting pot of cultures; the beauty behind races coming together to form a community and thrive, no matter who is in the White House. The lyrics say it best: Not a border, not a wall / not a line in the sand / could devise a plan / to divide us again.